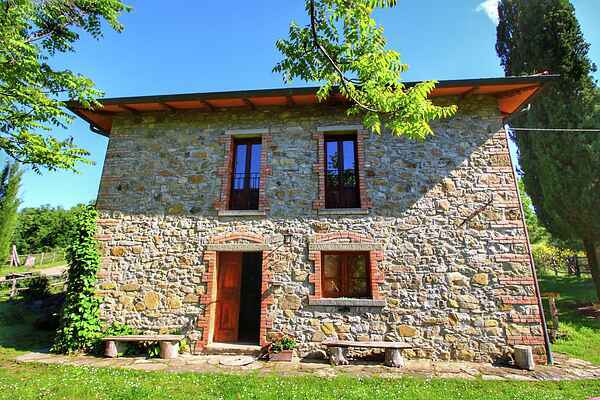 This beautiful stone farmhouse, situated in the Casentino valley, consists of 2 apartments with attractive, Tuscan country style interiors. Enjoy the breathtaking views from the house and from the swimming pool. The house has been fully renovated and features some typically Tuscan elements such as the traditional tile flooring, wooden rafters and wrought-iron and wooden furniture. At around 300 meters from the house you'll find a small swimming pond, a picnic table, barbecue and toilet. The large garden and the swimming pool are perfect for resting and relaxing. At the same time, this is an ideal base for cultural trips to Florence, Arezzo, and other Tuscan towns. The gorgeous views across the valley, the ancient woodlands and the surrounding villages are beautiful and you'll love the Tuscan countryside with its olive trees, vineyards, chestnut trees and cypresses. The closest town is Ortignano Raggiolo, which is about 3 km away. Opposite the castle in Poppi is a good restaurant www.albergocasentino.it with homemade pasta and Tuscan wines. Recommended! At Alimentari Ghega Bibbiena you can buy delicious and typical products.